Who says eating healthy is boring? This beautiful salad is just exactly what "Doctor" Mom would order. A colorful "rainbow" "suggested guide" to follow this summer to promote healthy eating"
Fresh fruits and vegetables are so essential for preventing diseases and keeping us healthy. Think of the rainbow to follow for a healthy food chart, guide. Not only is this a beautiful salad, but it is delicious and healthy! Yellow - yellow bell pepper and boiled eggs; pineapple, squash or butternut squash can be added; lemon juice for "dressing"
Green - spinach/arugula and avocado; green bell pepper or poblano pepper; lime juice for "dressing"
Layer spinach on the bottom of a plate. Add any and all ingredients that you enjoy and reap the health benefits! Remember that fresh fruit can act as a "dressing" on salad. 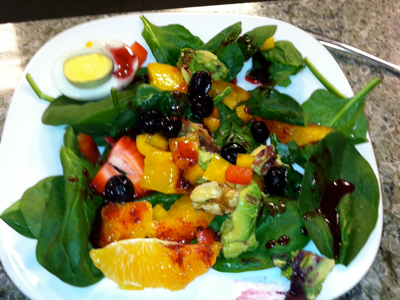 If you would like to make your own, healthier dressing, try my Blackberry Champagne Vinaigrette. If you have leftover champagne, save it to make this champagne vinaigrette! *garlic and shallot may be added to make this more savory, if you desire. I chose to make it a bit sweeter. In a blender, blend all ingredients together. Taste to see if any additional seasonings are needed. Keep in a jar for a week in the refrigerator.